We’ve spent many months anxiously awaiting all of the new offerings at Disney’s Animal Kingdom, and while many of my friends couldn’t wait to try out the new nighttime Kilimanjaro Safaris or see the Jungle Book: Alive With Magic show, I’ve been counting down the days to the opening of Tiffins (and neighboring Nomad Lounge). 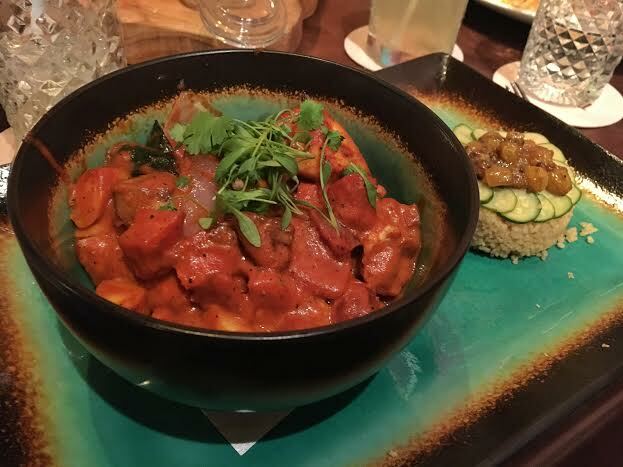 I dropped in for a dinner reservation this past weekend with several friends to see if Tiffins could meet the high standard set by other signature dining locations around Walt Disney World. You’ll find my thoughts on this epic meal below, along with those from a revisit a few days later (to see if the high-quality service and food was consistent). 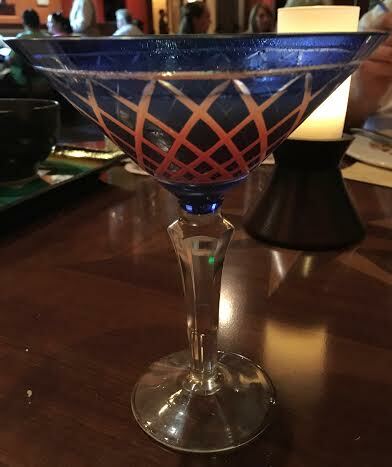 When my party arrived, we were promptly greeted at the host stand and checked in, but also warned that they were running about ten to fifteen minutes behind in seating tables; we were told we could wait in the lobby, or next door in Nomad Lounge, and that we’d receive a text message once our table was ready. We didn’t much mind the wait, and a few of us took a chance to wander the indoor and outdoor seating areas of Nomad in the meantime (what an incredibly gorgeous space – this really set the tone for what to expect inside the restaurant). About ten minutes later, we were summoned to be seated, and led to our table – not a bad wait at all! Our server, Deandra, was incredibly knowledgeable and friendly – she gave us a quick introduction to the restaurant and then went through the menu with recommendations and commonly asked questions. I was happy to hear her make solid suggestions, rather than just dance around which dishes were her personal favorites compared to what the house suggests. As we were a larger party, we chose to sample several appetizers and then each ordered an entrée for ourselves, both orders taken at once by Deandra. I have to admit – sometimes this approach by servers scares me; it definitely speeds up the meal by not waiting around to order after appetizers arrive, but it can sometimes throw off the pacing of a meal (like the dreaded “ending up with appetizer and entrée plates on the table at the same time” debacle that can put a halt to a good meal). As we discovered later, and you’ll see below, though, this fear was absolutely unfounded. Tiffins bread service breads: papadum, sweet multigrain bread, and naan. Tiffins bread service dips (clockwise, top right): lime chutney, black-eyed pea hummus, harissa yogurt, pomegranate molasses/olive oil mix. To start our meal off, we ordered Tiffins’ signature bread service ($10), house-made head cheese and chicken liver pâté ($14), black-eyed pea fritters ($11), marinated grilled octopus ($16), and lobster-popcorn Thai curry soup ($13). 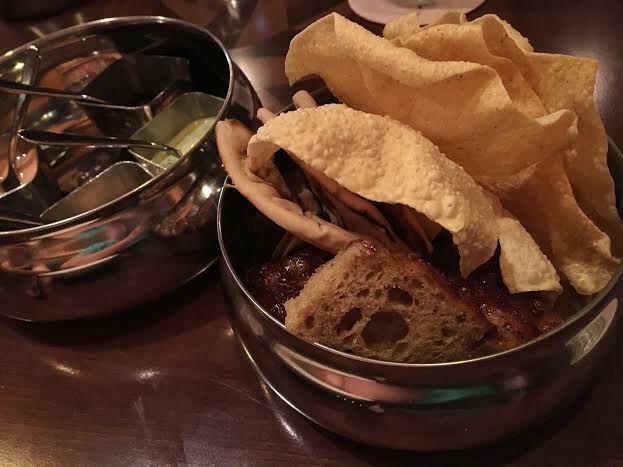 The bread service comes served in *an actual tiffin*, which I was pretty excited about; yes, the restaurant is named after a real thing – a tiffin is a multi-tiered, usually metal, food carrier that stacks together for ease of transport, common in South and Southeast Asia. In this particular tiffin, we received three kinds of bread (a sweet multigrain focaccia bread; a crunchy and light papadum cracker; and a chewy, salted naan) and four different sauces (a slightly bitey harissa yogurt, an even-bitier lime chutney, savory black-eyed pea hummus, and sweet and sour pomegranate molasses). Portions here were small for our group of five, but this would easily work if you’re sharing between two or three adults. 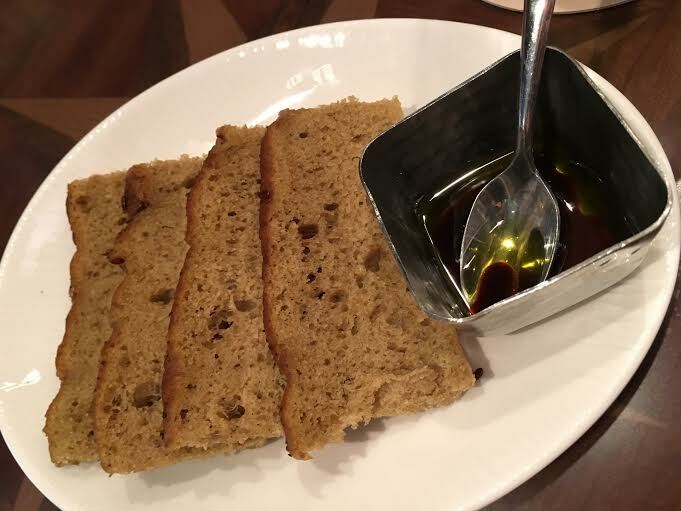 Worth a note: if you do not order the bread service, you still receive a few slices of the multigrain focaccia and the pomegranate molasses/olive oil dip complimentary with your meal. I appreciated that each of the breads and accompaniments wasn’t exactly what you’d see elsewhere around Walt Disney World (no repeats from Jiko, Boma, or Sanaa breads and dips here) and also that none of the dips were straight out of a jar, with pops of acid and fresh herbs dominating the lime chutney and harissa yogurt, especially. Some of the dips also made for great accompaniments with the black-eyed pea fritters ($11), as well. 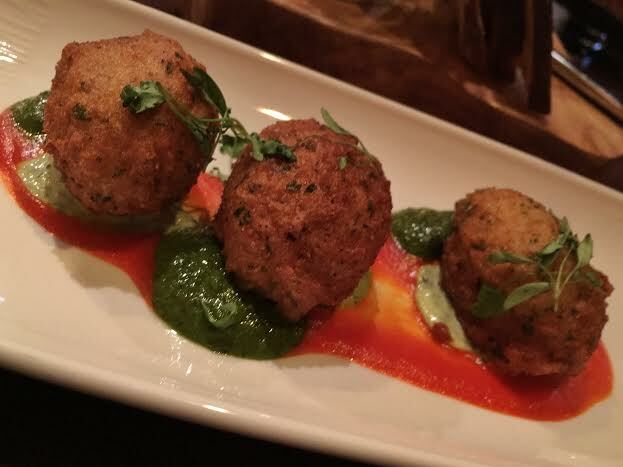 These were a lot like elevated, fluffy hushpuppies, mildly earthy in flavor but delicious when dipped in the zhough yogurt (garlicky and slightly spicy from the chilis, but cool and refreshing when mixed in creamy yogurt) or the sweet and mild peppadew pepper puree underneath each fritter. Both salads on the menu (roasted baby beets and the Archaeologist salad, $14 and $12 respectively) are absolutely gorgeous presentations, with standard vinaigrette dressings. 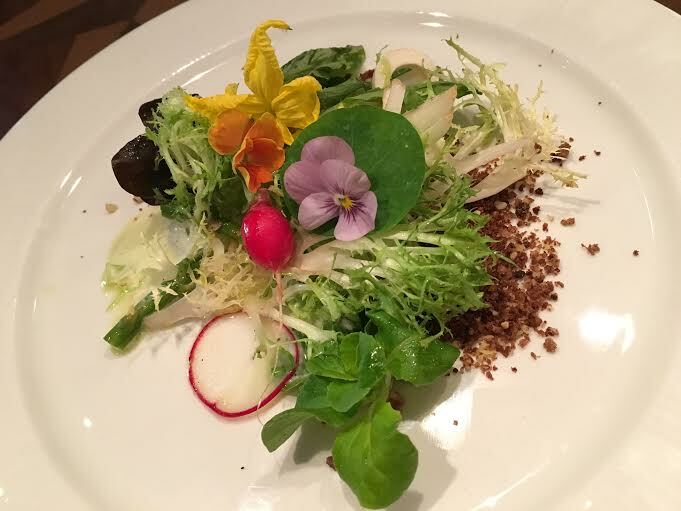 The beets are highlighted by cherry and cinnamon notes with a creamy goat cheese crema and crunchy walnut granola, while the greens and vegetables of the Archaeologist salad are elevated by a slightly sour champagne vinaigrette and savory crumbles of pumpernickel toast. Neither are mind-blowing, but work well as lighter, veggie-centric starters. Head cheese board with house-made pickles and pickled cauliflower. 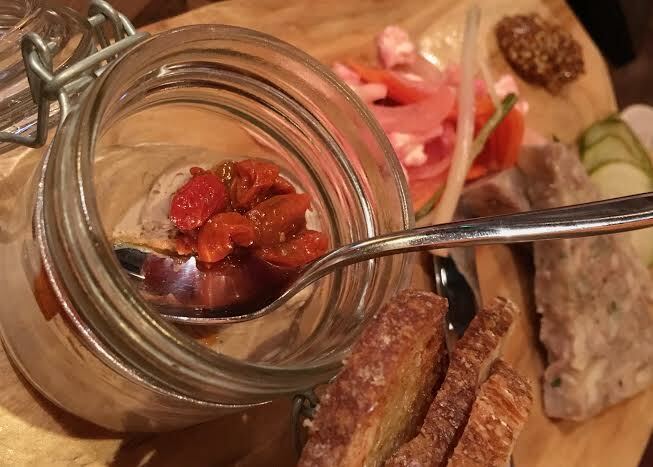 Chicken pâté with goji berry chutney accompanies the head cheese platter. The lobster soup, poured tableside (always a nice touch), wasn’t very spicy, as the “Thai curry” name would imply, but was very rich with a bisque-like texture on the soup, and a reasonably-sized piece of lobster at the heart of the plate; the popcorn, though, was barely noticeable (all texture lost once submerged in the soup). Our table balked a bit at our final two appetizers: the grilled octopus and the head cheese/pâté board – these aren’t pedestrian proteins, even for the more adventurous eaters among us. 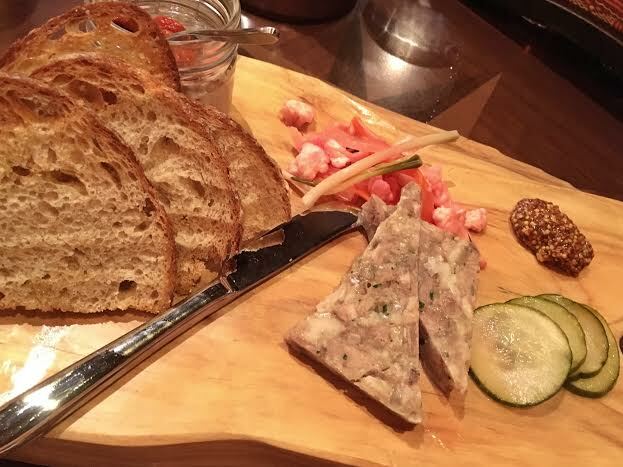 We all cautiously tried the head cheese and pâté, served with a few excellent house-made pickles and pickled cauliflower. The head cheese (a terrine usually made of tongue or other head-meats from various animals) was neither too fatty nor too gamey, common complaints for those not accustomed to the texture or taste of this delicacy. The real star on this plate, though, was the chicken liver pâté. I know, I know – that sounds utterly terrifying, but when spread on a crispy, buttery crostini, this creamy and smooth pâté was full-bodied and so incredibly rich, you’d probably forget what it is you were actually eating; it was a perfect bite to start our meal. 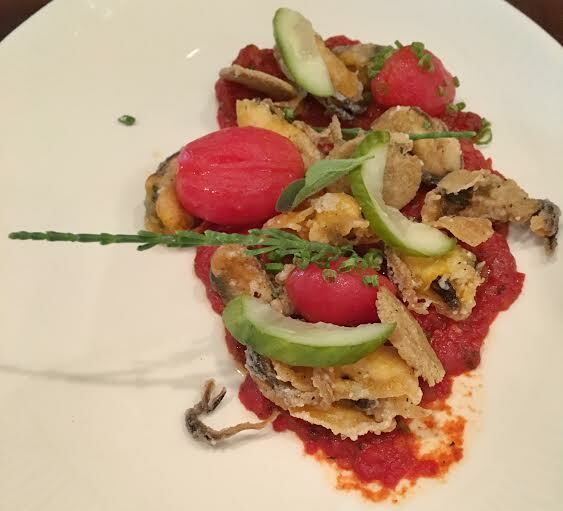 The flash-fried icy blue mussels ($12), lightly battered with a cornmeal crust, were revelatory, quite honestly, mostly due to the garlicky, sweet, herbaceous tomato confit at the base of the dish. We found ourselves fighting to sop up the dregs of the confit and za’atar butter with the last of our bread. Finally, I dove headfirst into the marinated grilled octopus (served with wine-braised artichokes, saffron aioli, and lemon-caper olive oil). To be honest, this dish blew my socks off with both flavor and texture (a pretty rare feat). 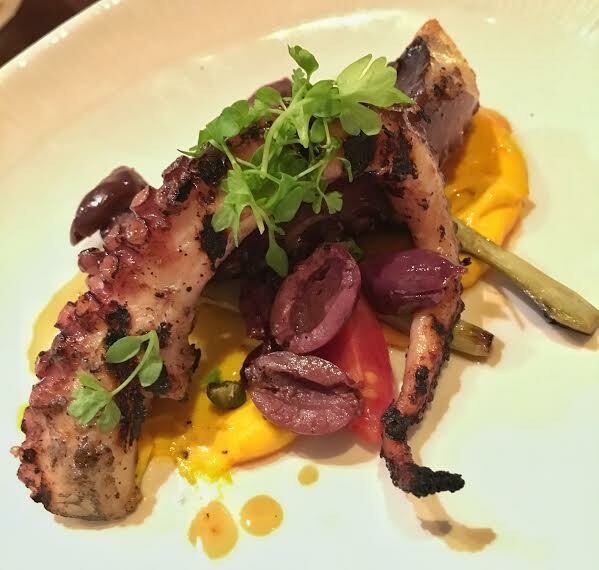 The grilled octopus is perfectly smoky, with a very meaty and not at all rubbery texture; the acidic olive oil, salty capers, and luscious saffron sauce cut straight through the slightly-bitter flavor from the char on the meat. The natural sweetness of the artichokes provides an additional layer of flavor, and bulk up the spectacular presentation of the dish. I really can’t rave about this dish enough – days after our meal at Tiffins, I was still thinking about every piece of food on this plate. Our appetizers had set the bar pretty high, so I was anxious to see whether our entrees measured up to this standard, as well. You’ll recall I mentioned earlier being a little fearful we’d end up with a few lingering appetizers half-finished by the time our mains arrived, but thanks to seriously excellent service on the part of several Cast Members, this was not the case. Even with taking our time sharing each appetizer with one another, server Deandra carefully paced our entrees such that she had time to clear our plates and make a mad dash to reset all of our silverware before new plates arrived (isn’t it the worst when you have a great smelling plate of hot food in front of you but no fork to eat it with? Not a problem here!). 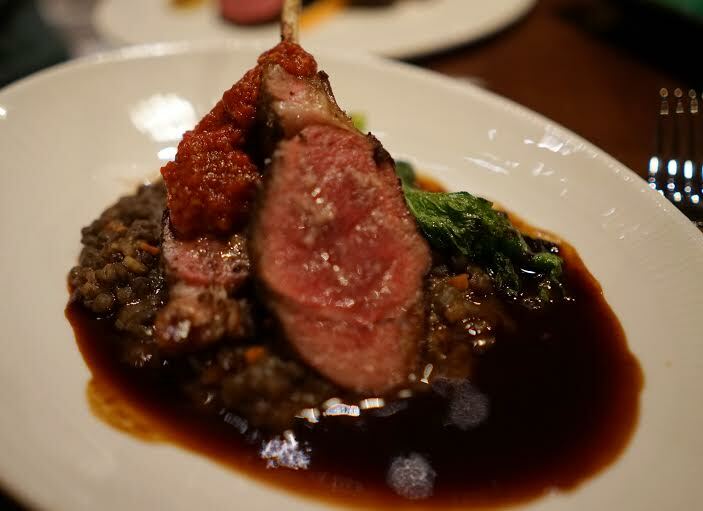 I’m a sucker for lamb dishes whenever I can find them, so my entrée choice was pretty easy here – the Berbere-spiced lamb chop with mustard greens, lentil stew, and tomato mint jam ($41). The spice rub on the outside of both large chops was only slightly spicy, with punches of fresh herbs throughout, and the lentil stew underneath was warm, rich, and hearty. The mustard greens were sparse (you’d probably think the two leaves on the plate were garnish, but they are actually part of the dish), but bitter to offset the sweet tomato jam atop the lamb; also, fear not the mint in this jam – no weird astringent flavor here, as you sometimes find in traditional preparations. I liked this lamb dish a lot, especially compared to most lamb plates I’ve had dining around Disney, but I have to admit, several of the other entrees I was able to steal bites of from my dining companions all had me coming down with a bit of entrée-envy. The Berkshire pork tenderloin with pork and masa tamale, hominy succotash, and red mole sauce ($39) brought the flavors of Central and South America to the table without question – the tamale was rich and dense with sweet corn and savory pork flavors marrying perfectly; the hominy (kind of like corn; also the base of grits) and bacon succotash underneath the tamale had a ton of smoke, but not enough to overwhelm the natural sweetness of the Berkshire pork. 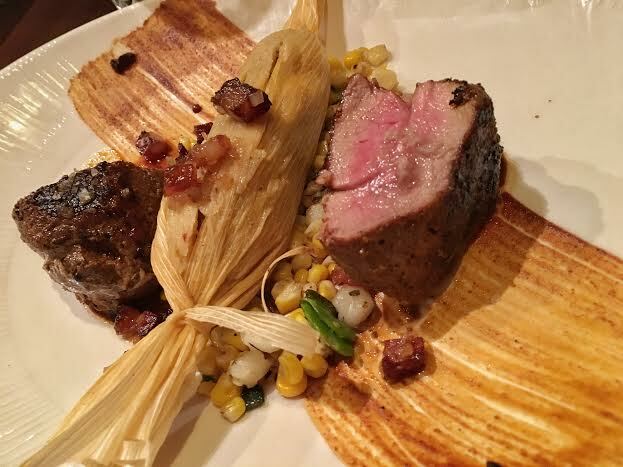 My only complaint on this dish was that I wanted more of the sweet and spicy mole (other than the sparse schmear on the plate) to help pair the tamale and pork tenderloin together into a perfect bite, but each component individually was spot-on. The roasted market vegetable curry with millet, spring vegetables (patty-pan squash, zucchini, carrots, red peppers), and lime chutney might be the closest thing to legitimately spicy food I’ve eaten at Disney. This base sauce of this dish has a warmth in it that absolutely surprised me, perfectly matched to the sweetness of the large chunks of roasted vegetables and cut by the acidity of the lime chutney. I initially tried just the curry by itself and felt it leaned a little too sweet, but that was quickly remedied once I tried a bite of the savory millet with the curry. 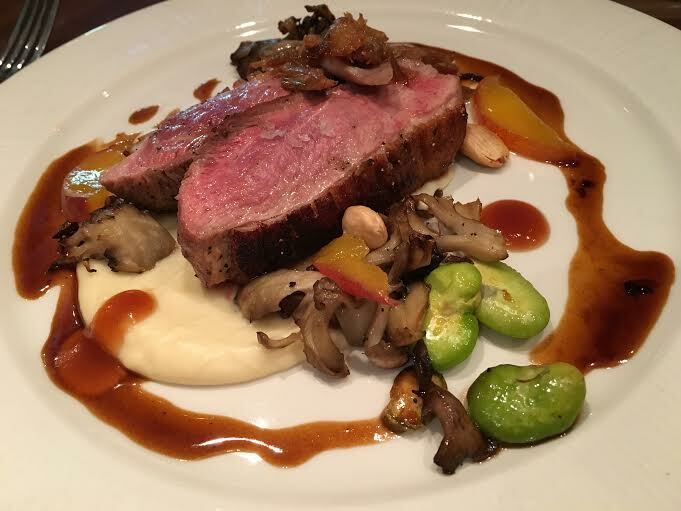 Even as a carnivore, I’d gladly order this dish as my entrée on a future visit – hearty and satisfying for any palate. 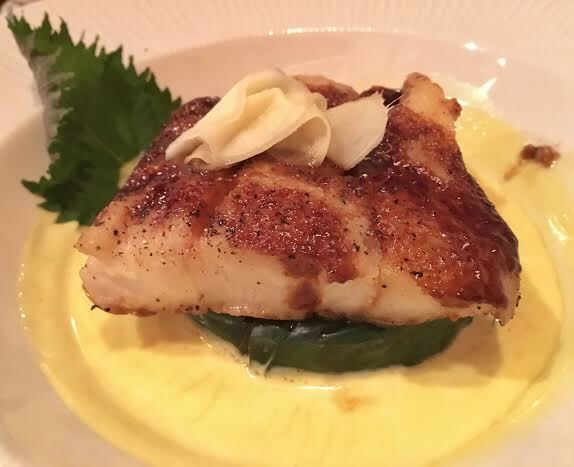 Another quality entree was the halibut ($42) – hoisin-glazed and served with forbidden rice wrapped in swiss chard over a turmeric sauce. The hoisin glaze gave the fish a slight crispiness to the top, sweet and sticky cut through by the slightly spicy rice, bitter chard, and incredibly rich turmeric sauce. This sauce reminded me a lot of the beurre blanc I raved about from Il Mulino a few weeks ago – definitely drinkable, creamy, with just the right balance of acid to it. Slightly edging the halibut out for tastiness, in my opinion, was the pan-seared duck breast ($39), served with duck leg confit, hen of the woods mushrooms, a luscious parsnip puree, and sweet and sour peach gastrique. Almonds and fava beans offer a bit of additional texture to the perfectly cooked duck, creating a rich and robust dish I’d gladly eat any day. 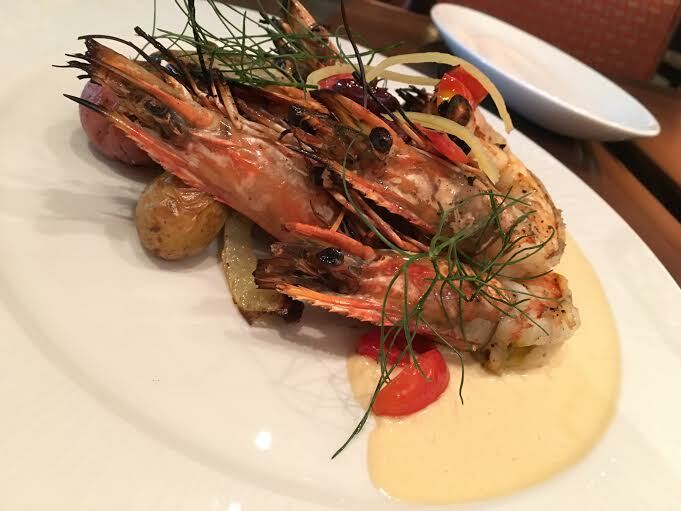 My favorite overall, though, might be the grilled head-on prawns ($37). Tomatoes, olives, and fennel ground the dish with earthy and acidic flavors to offset the slightly-charred prawns, which were much easier to eat than many probably fear – their heads pulled right off, little mess, and the remainder of the shells had already been taken care of in the kitchen (A+ move to keep guests from being ridiculously messy). The true star of this dish, though, was the sea urchin butter sauce at the base of the plate – you’ll find yourself soaking it all up with the prawns, then the whole roasted potatoes on the plate, then whatever else you can find. When the appetizers and entrees at a restaurant are as good as these had been, it seems downright irresponsible to skip dessert, so we decided to try them all. 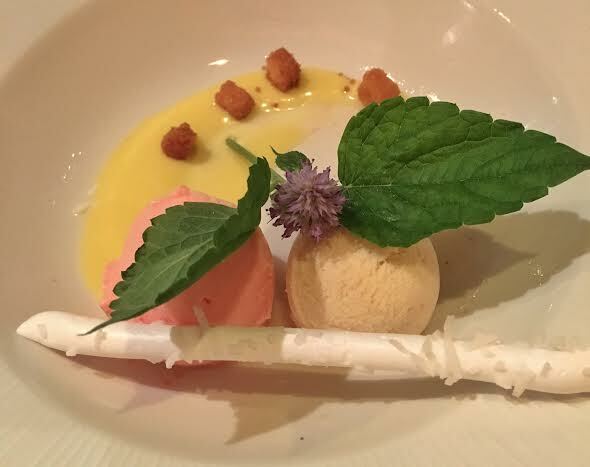 Our first bites came from the sorbet tasting ($9), lychee and passion fruit flavors with kaffir lime syrup, passion fruit curd, and crunchy vanilla croutons (note that you may instead encounter jackfruit and dragon fruit sorbets on any given day). I’m generally not one to jump at a seasonal sorbet plate on any dessert menu, and while this didn’t blow me away, this is probably a great option for those who want something sweet but aren’t dessert lovers – lots of fruity flavors here without knocking you over the head with something outlandish, with a bit of crunch from the croutons making it a pretty safe option. Also safe, but a better choice: the South American chocolate ganache ($12) – perfectly bitter and crunchy cocoa nib cookies, sweet bananas, and slightly sour pomegranate sauce accompany three pieces of the richest chocolate almost-brownies you’ve ever tasted. Don’t expect sweet and mild milk-chocolate here – this is deep and dark chocolate at its finest, accented with a bit of sea salt; also a small portion, but rich enough that you’ll be satisfied with what you get. The Calamansi mousse ($12) served with mango lava and swiss meringue plays up this fruit’s sour flavor (think: orange/lemon/lime citrus mixed with kumquat flavor) to a tee – it’s not at all subtle and only broken up by the slight sweetness of the mango lava and the single-bite meringue on top. 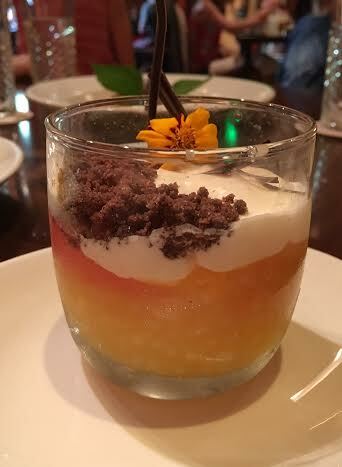 The passion fruit tapioca crème ($9) only slightly edges out the mousse as a better fruit dessert, with similar citrus flavors, but a fun tapioca/rice pudding texture accented by large sunken segments of grapefruit. There’s a bit of bitter and sweetness from the chocolate crumble and cream in the top of the beautifully-presented parfait glass to finish off the dish. Consensus around our table was that the best dessert was the lime cheesecake ($10). 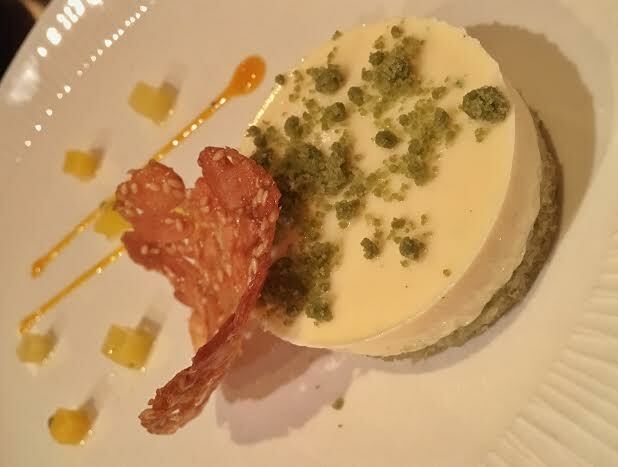 The very subtle citrus flavor (way less forward than the calamansi or tapioca desserts, if you’re scared of fruit flavors; also not as lime-y as a traditional key lime cheesecake) comes in the form of the creamiest cheesecake I’ve ever had, with a green tea sponge underneath that grounds the dish with earthy and herbaceous notes. The crunchy and nutty almond-sesame tuile and the perfectly diced bites of mango on the side give the dish texture, but most of all, expertly echo the earthy and fruity flavors of the main components without overwhelming them. 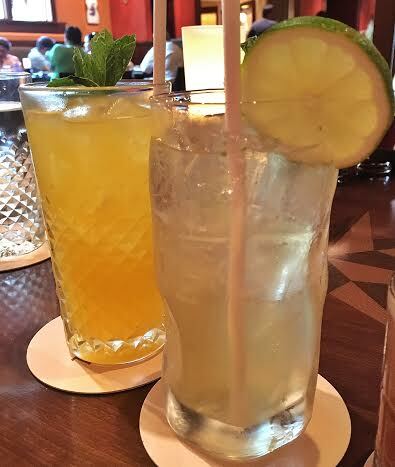 We made the most of both Tiffins’ and neighboring Nomad Lounge’s bars, sampling several alcoholic and non-alcoholic drinks from both menus. When seated, you receive a great wine list (bound in leather, just like the beautiful food menus), and the main menu has six available cocktails (four alcoholic, two not), but we were curious about the entire slate of option. I requested a Nomad Lounge menu, and without hesitation, my server brought one over. 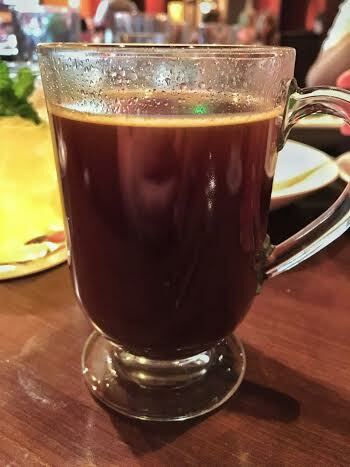 On my second visit, I also asked if Nomad’s drinks were available in the restaurant, and had no issues ordering one. Your mileage may vary here, since the drinks come from two separate bars, but it’s always worth asking if none of the cocktails on the standard Tiffins menu float your boat. From the main menu, I sampled the Anapurna Zing (Bombay Sapphire East gin, passion fruit puree, mint, lime, ginger beer; $8.50) and the Hightower Rocks (Casa Dragones Blanco Tequila, watermelon, sweet-n-sour, lime; $12.50). The Zing is the alcoholic version of the Zingiber Fizzie ($6), both incredibly refreshing and fruity without being cloyingly sweet. The Fizzie was a lot like drinking Orangina mixed with ginger beer, and was slightly more effervescent than the Zing, a great cocktail for those afraid of gin’s sometimes mouthwash-y flavor, and any fans of Moscow Mules. 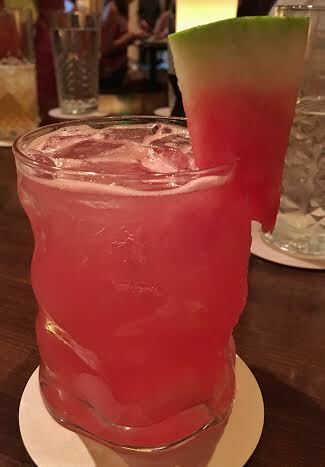 The Hightower Rocks ($12) was essentially a watermelon margarita, tending towards the sweet – it wouldn’t be my first choice to pair with savory food, but it would work as a dessert cocktail. The Hibiscus Henna ($5.50) is the non-alcoholic alternative to this drink, similarly sweet but soda water helps balance that out a bit more. 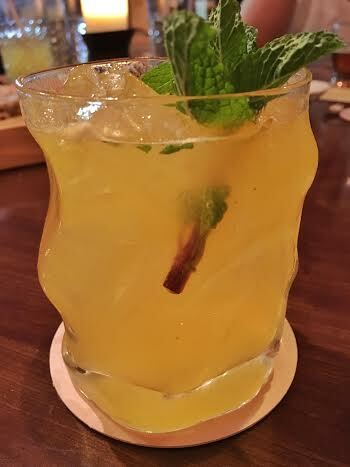 From Nomad Lounge’s menu, we first sampled the Snow Leopard Salvation (Snow Leopard vodka, Bell de Brillet Pear Liqueur, mint, and lime juice topped with ginger beer; $12) and the Tempting Tigress (Russell’s Reserve 10yr Bourbon, St. Elizabeth Allspice Dram, tamarind syrup, and lime juice; $12.75). Part of the proceeds of the Snow Leopard Salvation go towards a charity working to protect the snow leopards, so obviously, you’re doing a good deed by sampling this slightly sweet and citrus-forward refreshing drink. 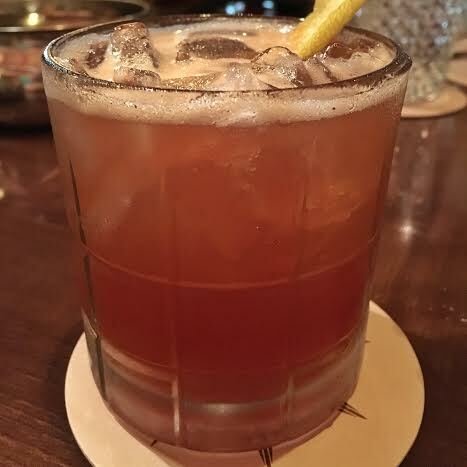 The Tempting Tigress was a perfect bourbon drink (rare, I’ve found, at Walt Disney World), using sweet and tangy tamarind to balance the caramel notes of the bourbon, and allspice to make the whole drink a party. Next up, I sampled the Night Monkey (Bacardi Gran Reserva Maestro rum, guava puree, coffee simple syrup, lime juice, and a hint of cilantro; $9.50) – this was too sweet for my taste, even with the slight bitterness from the coffee syrup, but if your preferred cocktail spirit is rum, you’ll likely enjoy. 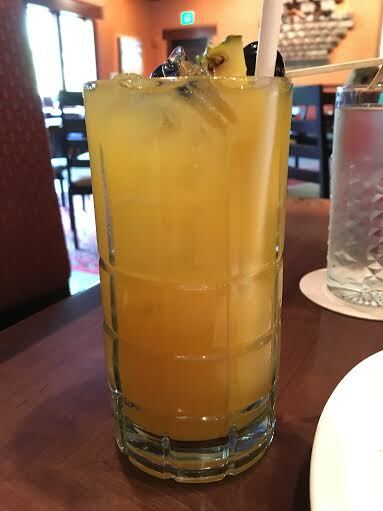 Same goes for the Leaping Lizard ($12.75), with Malibu Pineapple rum, Augusta cachaça, orange, passion fruit, and mango juices – this drink wouldn’t be out of place at Trader Sam’s, so if this is your flavor profile, go for it. With dessert, a few of us split one cup of Mustang Coffee (Crown Royal, brown sugar, butter, and hot coffee; $9.50); I’m not typically a coffee drinker, but even the coffee fiends among us could hardly tell there was liquor in this drink (trust us, there was) – rich and smooth, this is a dangerous drink, but a perfect pair for many of the desserts, particularly the South American Chocolate Ganache. Along with the bill, each table receives a print by Imagineer Joe Rohde. I’ve touched on it a little earlier, but it should be said that portions here at Tiffins are on the smaller side – nothing here is going to leave you overly full on its own. This is becoming an increasingly common trend all over Walt Disney World restaurants, though, especially signature dining locations. Flavors in these dishes, however, are a bit bolder than you’ll find elsewhere on property, which I found to offset the portion size and ultimately left me satisfied with my meal. Overall, service was impeccable, top to bottom. 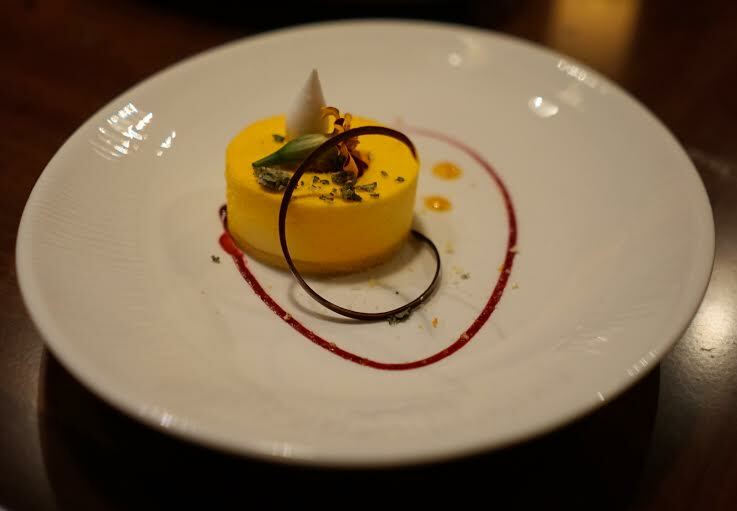 Everything was seamless, which, with large parties and uncertain timing, is something even top signature restaurants at Walt Disney World (and elsewhere) struggle to accomplish – everyone was always on top of drink refills, quick to offer recommendations for every course and for drinks, and perfect pacing for each course. 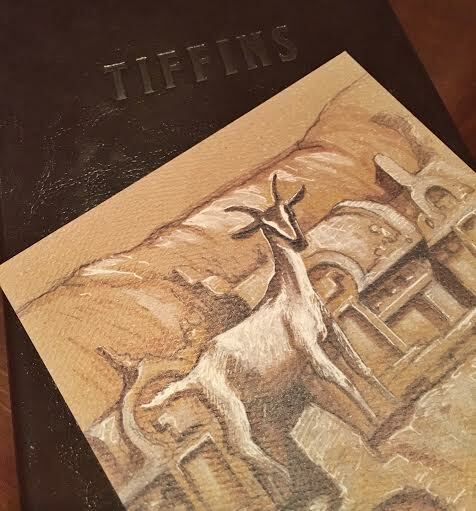 Even on my return visit to Tiffins (at a different time of day with a smaller party), service was consistently excellent from both our server Michael and all of the food-runners. Between the two visits, it’s fair to say that this was, without question, the best service I’ve ever had at a restaurant inside a theme park; in fact, it rivals even the best white-tablecloth WDW restaurants like Citricos for service (and truthfully, yes, for food, too). Tiffins is now easily the best inside-the-park restaurant in Walt Disney World – it blows away food and service anywhere else, including the restaurant that formerly held this crown for me, The Hollywood Brown Derby (where service and food have both been lacking, of late). 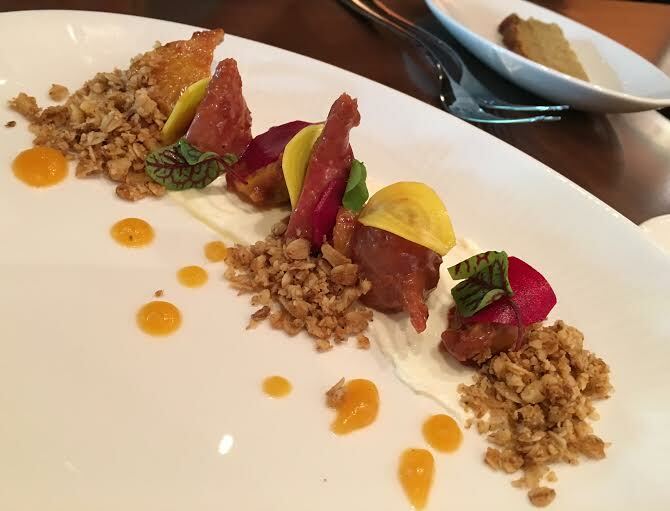 Plates are jaw-droppingly gorgeous in presentation, with bold flavors to back up the beauty. Few restaurants, inside-the-parks or out, can compete at this level consistently in all facets. Ultimately, the job of a good restaurant is to meet and exceed your expectations for the things you’d normally order, and maybe push you a little outside your comfort zone – one foot outside the box. Great restaurants can push you head-first out of the box, only to have you looking back after the meal going ‘wow, I actually ate those things and really liked them’. Head cheese, head-on prawns, grilled octopus: these aren’t things that typical diners at Walt Disney World would normally flock to, honestly. 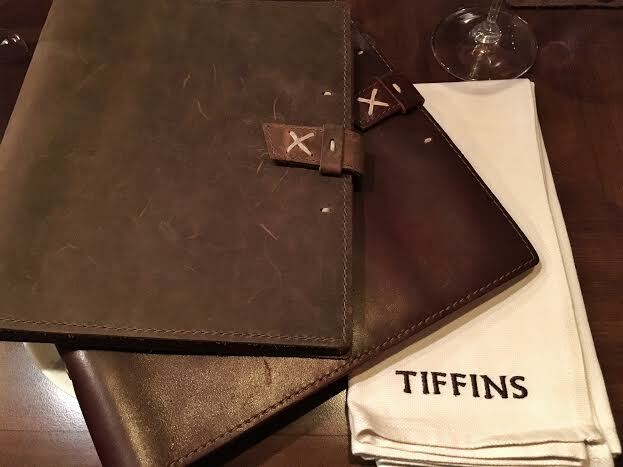 Tiffins’ menu is so fantastically executed, though, that they engender the trust of anyone who walks through their doors – ‘this sort-of-scary dish was so good, maybe I’ll also like this thing that sounds terrifying’. This menu and the resultant bold flavors, for the most part, do not cater to the middle of the road at all, and even with taking risks, they succeed at what few other Walt Disney World restaurants nowadays can’t – a well-rounded menu packed with beautiful plates of delicious food, complete with excellent service, to boot. I can’t wait for my next meal at Tiffins, an excellent addition to the Walt Disney World dining landscape. We ate their Tuesday night. Have to disagree about the Lobster soup: I needed about 3 more bowls of it. You didn’t mention the Waygu beef and shortribs entree. I’ve had similar meals around the parks, and this was head and shoulders above the rest. I think it’s worth noting that the Nomad Lounge doesn’t require reservations, and the outdoor seating area incorporates non-traditional seating (in particular: Couches and pillows). After dinner, we sat in the outside seating area to watch the rain storm and had a wonderful tea service. Right now, the only real view (in the distance) is of the huge crane putting together Pandora, but you get a lot of good jungle atmosphere. 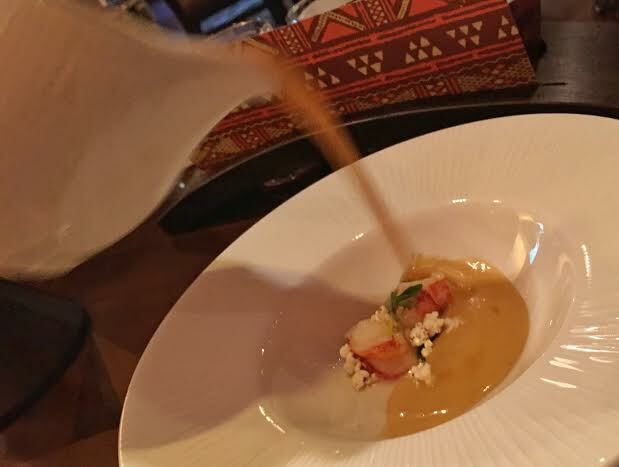 I think the lobster soup was still pretty good, but compared to the rest of the appetizers I sampled (everything but the fish crudo), it was the one thing I think lacked comparatively. I’m glad to hear you enjoyed it, though! We didn’t get a chance to sample the Wagyu, but others have mentioned how great it was – this is seems to fit with how excellent all the rest of the entrees we did try are. I got a chance to walk around Nomad Lounge just before our first meal there – what a gorgeous and comfortable place! Your idea of riding out the rain with tea service is one I might have to steal on my next visit. I’m also interested in trying out some of their food options, too! Just one thought on your concern about entrees arriving before appetizers had been cleared, I would never expect that to be done at a fine dining restaurant, the waiters and kitchen staff should be able to pace things correctly. Although this could be because I am used to eating in Britain. The only time I had it happen was at Disney (Boatwrights at POR) and we sent the main course back to the kitchen as we were only halfway through starters. 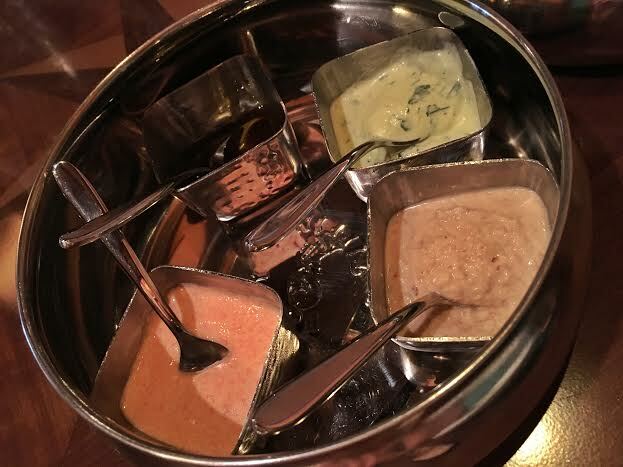 You are definitely correct – this shouldn’t happen at any fine dining establishment, but oddly enough, it happens to me quite a bit at Disney signature restaurants (and, like you said, at places like Boatwright’s). It was nice to see that everyone at Tiffins, even only a few days after they’d opened, was working on the same page in service of the diners. That happened to us at Paradiso 37 on our most recent trip in April, and we did the same thing – sent it back to the kitchen and had them re-make it (it was a burger and fries, which certainly could not be held) when we were ready for it. Thank you ! Thank you! Thank you! I absolutely love your reviews! It is so nice to hear from someone who actually enjoys and understands dishes beyond meat and potatoes. I have been longing for this restaurant to open, and your review makes the wait to try it so much more unbearable. Thanks so much, Scott! Tiffins is definitely worth the wait. 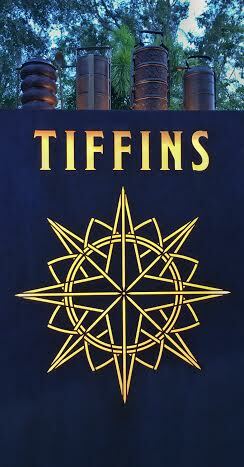 I am beyond excited about Tiffins. WDW has been dumbing down it’s food selections for decades- it’s nice to see a new addition that asks eaters to expand their pallet a bit. I agree, Sarah, it’s great to see places without expected/standard menu selections. I still think Tiffins can work for pickier eaters, but it’s nice to have other options, too! How long did it take you to get through dinner? I’m sure it’s a bit unfair to judge right now since they’re still probably trying to get a flow going, but my wife and I were there Saturday night (dinner package) and it took us almost two and a half hours before we were finally finished. We ended up missing a fast pass and a show that we had planned on. With our large group, we were there a little over two hours (which is about what I’d expect with what we ordered, number of people, etc.). When I went with just one other person, a little less than an hour and a half (admittedly the restaurant appeared to be less crowded that second visit). I wonder if they’re still trying to get their feet under them with regards to Jungle Book dinner package timing – hopefully that was just a one-off situation! Excellent review..in fact, you have quickly become the new paradigm for Disney dining reviews. One FYI if I may…there is no such term as “a tamale”. The singular of tamales is tamal. Also, I agree with you about the Brown derby being the best in-park dining…at least, until Tiffins came along. 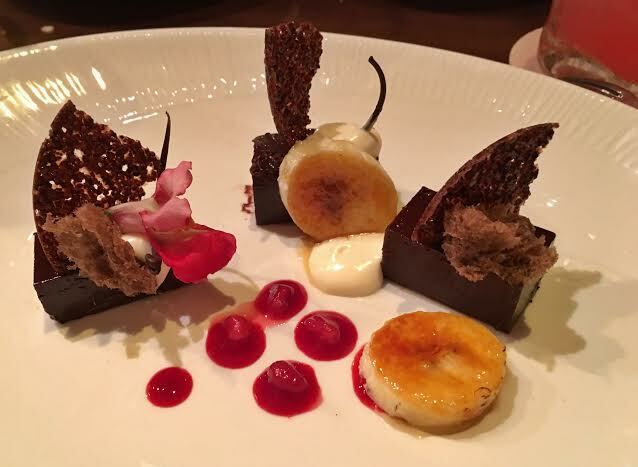 Really I’m the only one who sees twig and berries in that sorbet dish? I mean it even has a fig leaf and like extra white chocolate on the twig. Why would they choose that shape? Is it also inappropriate to call the people of Sri Lanka who refer to themselves as Kaffir the name that they use for themselves? Just wondering because that is where the limes in question come from and has nothing to do with the racial slur that you are trying to attach to it.